I like making all the things! When Laverne Waddington visited the Weavers Guild of Greater Cincinnati in October this year, she brought with her some small swords used for beating weft while weaving bands. They were for sale, but I looked at them and thought “I could make that.” Over the summer, my husband, kids and I visited my aunt and uncle in Florida. My Uncle Tim is a maker himself and a master at finding deals. While we were there, he dug around in his shed and pulled out a dusty bucket of Ipe wood for me. Ipe grows in tropical areas of Central and South America and is very durable, rot and insect resistant. It’s a very dense wood and is said to be difficult to work with, but luckily I haven’t had any issues. It makes beautiful swords to weave with! I weave on several types of looms. At the moment, my favorite is a 50 inch width cherry handmade Norwood jack loom. The original owner’s manual written in the 1950’s calls these looms “The Weaver’s Easel”. Norwood Looms originated in Cadillac, MI. Wallace McGarr, who learned furniture making during the Great Depression and his wife, Melvina moved the company in 1950 to Baldwin in Northern Michigan. According to his grandson, Mike McGarr, Wally wanted to call the company “Northwood Looms” after the beautiful forests in the area. The name was already taken so he improvised with “Norwood Looms”. 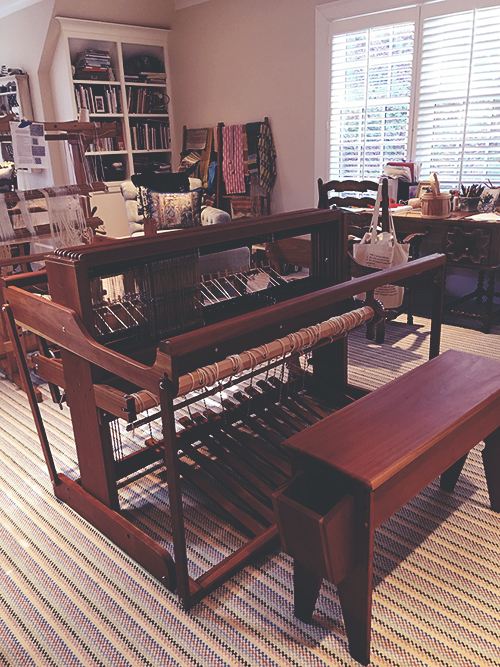 For the next 21 years Wally built the looms and accessories out of solid cherry while Melvina operated a weaving/gift shop and provided weaving instruction. Norwood Looms became equated with hand weaving excellence. In 1974 the McGarrs sold Norwood Looms to Ted and Nancy Johnson who moved the woodworking shop to larger quarters in neighboring Freemont, MI. (Fun fact: The Johnson’s made the original Cranbrook countermarche loom which they later sold to Schatt.) The Freemont loom builders worked under the direction of Wally McGarr for several months before taking the helm. All production ceased in 1996 when the Norwood name was sold to Webs and production moved overseas. Ash or Birch became the material of choice. So, if you come across a Norwood loom made of cherry, you know it predates 1996. The location on the label will tell you if it was made by the McGarrs or by the Johnsons. When I saw my loom listed for sale my son was home for a few weeks between graduating college and beginning graduate school. I knew he would never live home again and I relished the time. 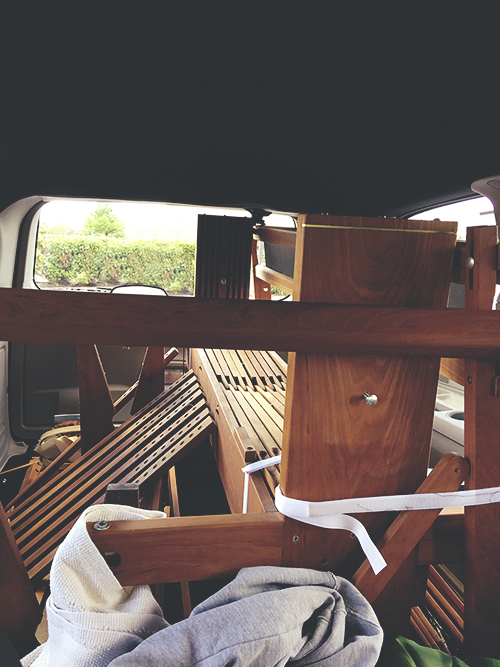 We took a 13 hour road trip in one day to get my loom. Thirteen hours of my 22 year old son all to myself! He was a champ. That crazy road trip, the insanity of driving 13 hours for (albeit) a special loom, and his willingness to do it with me makes the loom all that much sweeter. I often smile at the memory when I am weaving. I appreciate that my Norwood was hand crafted by people who truly took pride in their skills and product. I feel that sentiment somehow translates from the loom to my weaving. When researching this post I contacted Mike McGarr to fact check. He is a metal artist in Michigan and is thinking about starting to build looms in his grandfather’s tradition. All I can say is fingers crossed.